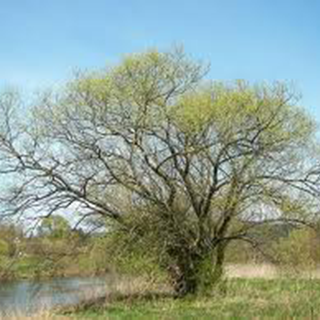 Originally found in temperate or cold regions in the northern hemisphere, white willow was classified as a cool and moist remedy due to its preference for growing near water. In 1828 the Bavarian pharmacist, Johann Buchner (1783–1852), extracted bitter-tasting crystals, which he named salicin, from the bark; these were synthesised as aspirin by Bayer in 1899. Take 20–40 drops (1–2ml) of the bark extract in water 3 times daily for rheumatic conditions, lumbago, sciatica, and neuralgia. Combine with an equal amount of rosemary tincture for headaches. Use 1–2 tsp (5–10ml) doses of the bark tincture 3 times daily for fevers: generally combined with other herbs such as boneset (Eupatorium perfoliatum) or elderflower. Add 20–40 drops to menopausal remedies to help reduce night sweats and hot flashes. Drink 1 cup (1–2 tsp bark per cup of boiling water) 3 times daily for feverish chills, headaches, or as part of arthritic treatments with herbs such as St. John’s wort and crampbark. Drink 1 cup (1–2 tsp leaves per cup of boiling water) after meals for indigestion. Prefers moist but well-drained soil. Propagate from semi-ripe cuttings in summer or hardwood cuttings in winter, although it can be grown from seed. The bark is stripped in spring from branches of two- to five-year-old trees that have been pollarded.